In three short days, I jump on a plane bound for Amsterdam. It’s my first chance to get out of the country since 2008, when I went on a celebratory (but penny-pinching) “I graduated undergrad!” jaunt to London and Paris. I studied abroad in India during that aforementioned undergraduate experience, but I never would’ve guessed I’d be here, three years into a doctoral program, about to do it again. Hi, everyone—or “hallo,” as I will be about to say in The Netherlands. 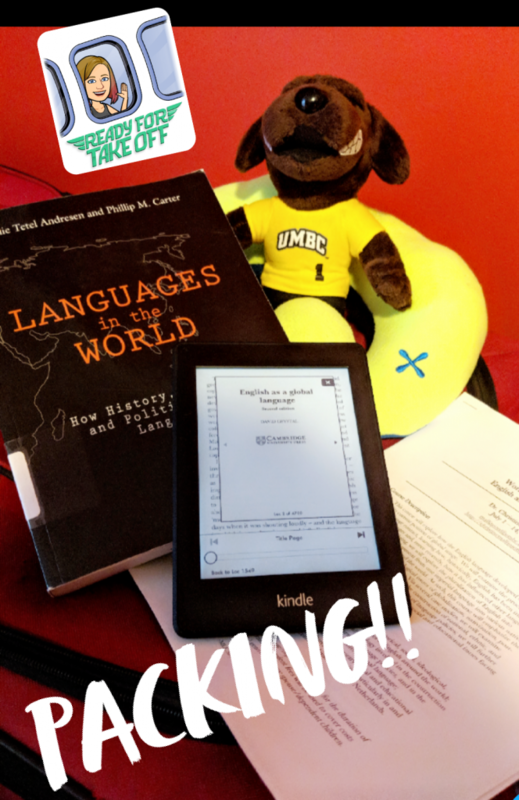 I’m Mary, a PhD student in Language, Literacy, and Culture and a full-time working professional at the Universities at Shady Grove. I feel excited and blessed to be able to participate in this study abroad program, led by one of my favorite UMBC professors, Dr. Mallinson (no joke: this will be my fifth course with her). My semester abroad in India was an amazing, life-changing experience that I never expected to be able to replicate. Between working full-time and going to school part-time, I’m not as free and unencumbered as I was as an undergraduate. In fact, I feel even more “encumbered” than usual, since I’ll also be in the middle of my doctoral comprehensive exams (a writing and reading marathon) while abroad. 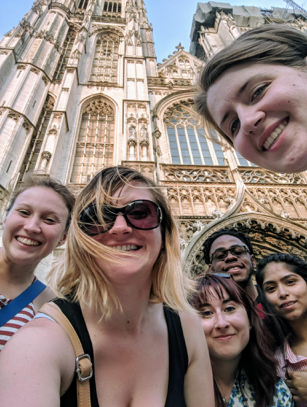 It’s much more of a stretch now to make study abroad possible, and I recognize that I’m incredibly lucky to be able to take time away from work and to have an option relevant to my specialized graduate studies. Serendipitously, the topic of the course, English as a Global Language, is equally relevant to my professional work in a learning, tutoring, and writing center for a diverse population of transfer students. Nowadays, I identify as a professional first, not a student, and thus it will be important for me to reflect on and share with you the ways this opportunity might further the person I am outside of the classroom. 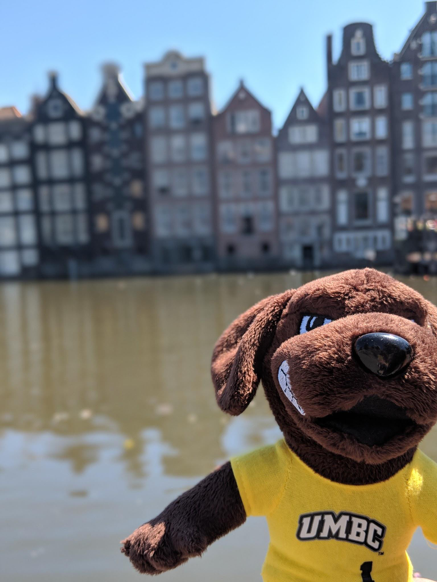 I hope you stay tuned over the next two weeks as I share a flavor of Amsterdam and our studies! the hostel, my lack of Dutch has been about as problematic as the experience I described at Keti Koti (in other words, not a problem at all). English has official status in the city, though not in the rest of the country, and the people of Amsterdam seem to move between languages with a dancer’s agility. It takes a few seconds, a tentative, imperceptible heel turn, for them to mark me as an English-speaker and offer me the boon of my own language in a foreign country. Perhaps I haven’t perfected my “hallo,” but sometimes I don’t need to say a single word, and yet I still get English. I think my tourist must be showing. You may be getting the picture that Amsterdam is an easy travel destination for an English monolingual like myself. I can’t complain–that moment of panic I had trying to buy water was a humbling reminder of the comfort inherent in knowing I can make myself understood without struggle, that I have a voice I can use to get my needs met. I think, with renewed awe, of the amazing bravery and resilience of the many students I’ve worked with who made another country, another language, into a home. 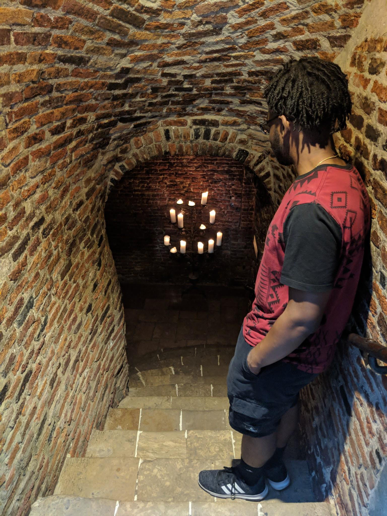 My challenge was laughably insignificant compared to what they have overcome, but this is what travel does: it reminds me that my privilege is showing, too. During orientation, our program coordinator asked us what words we would use to describe our initial impressions of Amsterdam. 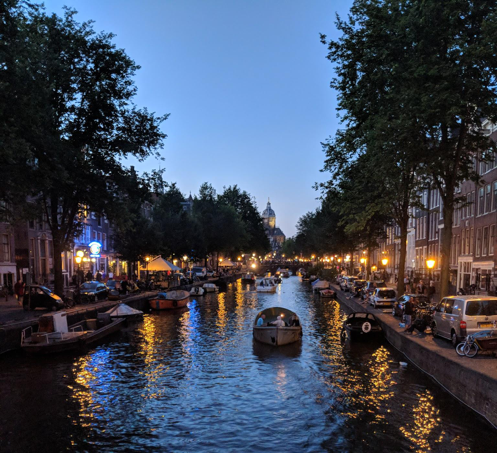 A few my classmates offered were “energy,” “chill,” “cultured,” and “dope.” What immediately came to my mind was “colorful” (Amsterdam does love orange) and “bold.” I hope a little of that boldness will rub off on me over my next two weeks here. We all have chains that hold us back, some stronger and more restrictive than others. 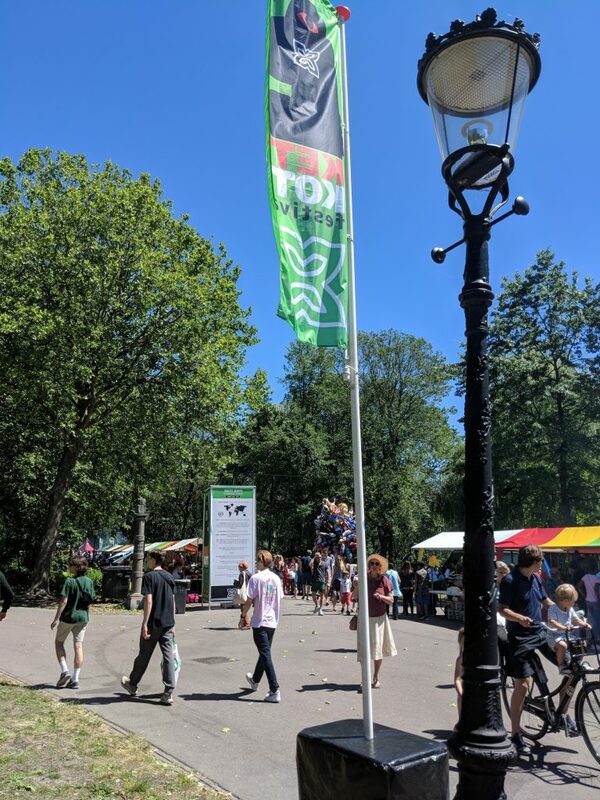 Any celebration of independence seems a good chance to really look at your own chains and break what you can, to do as Amsterdam does and be bold, be cultured, be flexible, just plain be more dope. So here we go, Amsterdam. Dank je wel (thanks a lot) for the first lesson. Let’s keep ‘em coming. Today in class, Dr. Mallinson reminded us of the biblical myth of the Tower of Babel. As the story goes, the people on Earth united to build a tower high enough to reach the heavens. They did a super job. Too good, really. So good that a worried God put a tidy end to their tower by ‘cursing’ them with multiple languages. With no way to communicate, their efforts fell apart. The heavens remained forever out of reach. Dr. Mallinson brought up this origin story because she wanted us to see that it portrays linguistic difference as synonymous with chaos. Languages separate us, end our progress, and keep us locked to the ground, restrained and fractured. It’s quite a pessimistic view of our world’s vast language diversity, but one that does still find support in the world today. Yet perhaps not so much in the scenic town of Leeuwarden, the capital city in the Netherlands province of Friesland. A train, another train, a bus, and one last train transported us here from bustling Amsterdam. 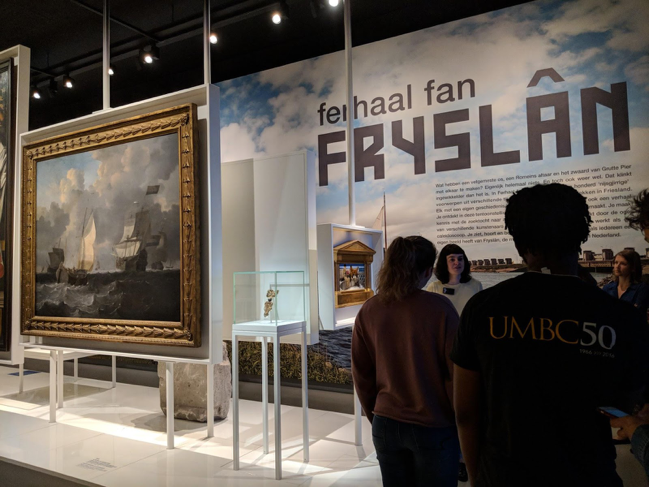 We came to meet Dr. Coler, a professor at the new Campus Fryslân branch of the University of Groningen, and to tour the Friesmusuem, which showcases the past, present, and future of Friesland. What’s notable about this province for the purposes of our course is that it stood separate from Holland for a time when, centuries ago, the rest of the Netherlands was conquered but it was not. This resulted in Friesland retaining its own language, West Frisian, a language it has worked determinedly to preserve in spite of the growing influence of Dutch and English in the Netherlands at large. Nowadays, Frisian is recognized as an official language of the Netherlands, and the Fries people are frequently trilingual, learning their own Frisian as well as Dutch and English. In Tower of Babel terms, I guess you could say they’re pretty fragmented. In modern terms? It works. While visiting the expanding Campus Fryslân, we had the chance to meet two doctoral students in addition to Dr. Coler. One of the students is studying multilingual writers and the choices they make to express themselves in one of their languages. The other is investigating the mechanism through which doctors unconsciously recognize Parkinson’s disease just from patients’ speech. Altogether, these three represent quite the smorgasbord of cultures and languages. Dr. Coler is from the United States; the students, from Russia and Sweden. Combined, the three of them are capable in probably a dozen different languages, but they share no native language. It’s likely, also, that the students share a native language with scant few–if any–of their mentors, professors, and classmates. Yet here they are doing amazing, important work–and succeeding. Language diversity can create problems, no doubt about it. But Friesland was a wonderful reminder of the ways that same diversity can bring us together. Even when it’s a challenge, we find ways to unify and grow, to maintain our own language identity but allow in more. We keep reaching for those heavens, only now our differences are helping us lay the bricks. 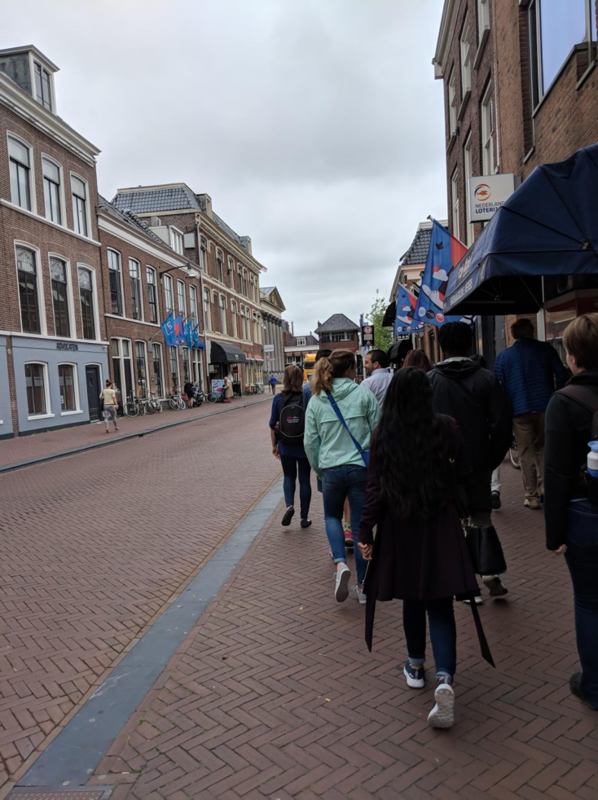 In addition to the time we’ve spent together in the classroom, a large component of the learning experience during this course has included museums here in Amsterdam and cultural excursions. I talked about our trip to Friesland in my last post, but now I want to overview some of the other places we’ve been able to go in the past week and a half. A big part of our cultural exposure has happened through museum visits. We each received a Museumkaart, which gets us free admission to a huge number of museums not just in Amsterdam, but throughout the Netherlands. We’ve had a lot of flexibility to choose museums that interest us. 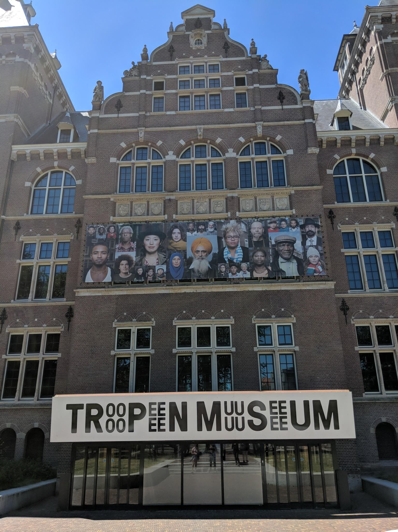 One of my favorites was the Tropenmuseum, an ethnographic museum with exhibits on fashion and ones that consider the frequently strained relationship between Holland and its former colonies, Suriname and the Antilles. 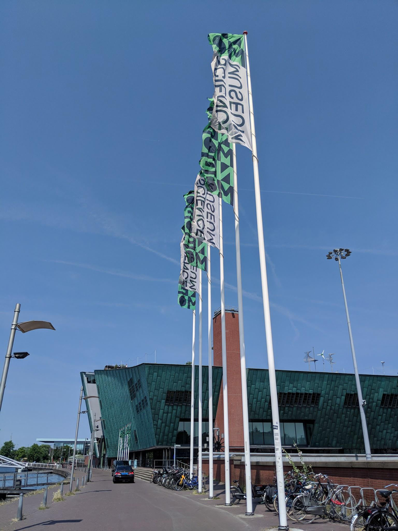 I also visited the NEMO Science Museum (with phenomenal views of the city from its rooftop deck), the Hermitage Amsterdam, the Portuguese Synagogue, and Museum Willet-Holthuysen (showcasing an 1800s canal house). This past weekend, we had an overnight excursion in Belgium. 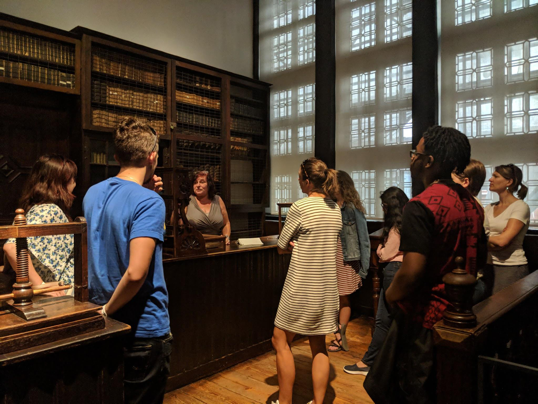 In Antwerp, we visited the Plantin-Moretus Museum, a printing museum, and the House of Literature, which commemorates Dutch writers throughout history. In Ghent, we visited the Ghent City Museum, covering Ghent’s development from a medieval city to a modern, multilingual cultural center. 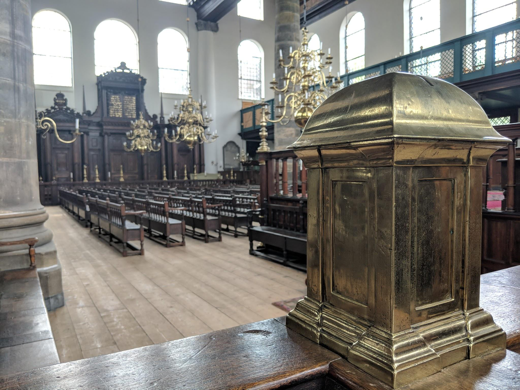 Of these museums, the Plantin-Moretus Museum was particularly interesting–Christophe Plantin and his son-in-law Jan Moretus were influential figures in the history of printing that we don’t hear much about in the United States. 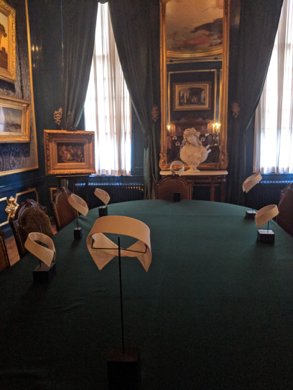 The family was wealthy enough to own a huge property in Antwerp that housed both the printing business and their living quarters, and you get to see a little of both in the museum. 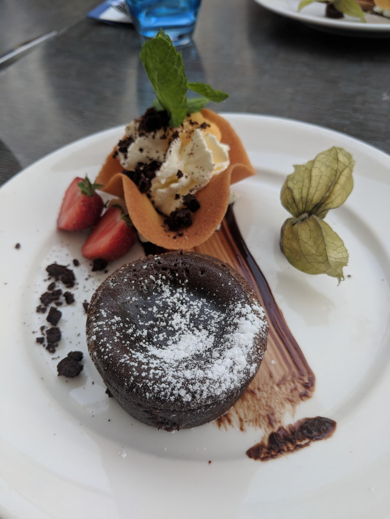 The cities, too, were fantastic, with some of the most picturesque architecture, and I must say that Belgium’s food was on point. The chocolate was phenomenal, of course, but all of the food was so flavorful. In Antwerp, we even ate in Medieval-style dungeon! 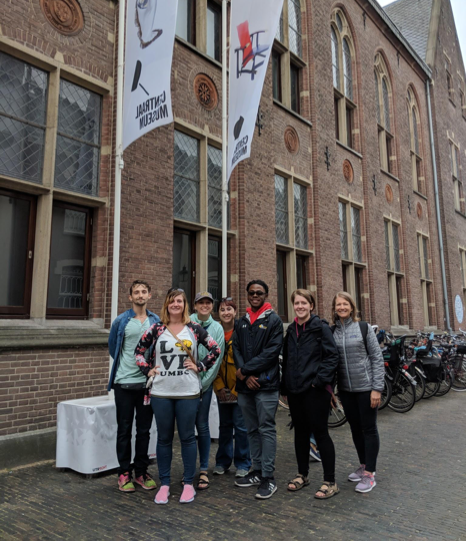 Today we were in Utrecht, where we visited the Centraal Museum and took a walking tour of the city. 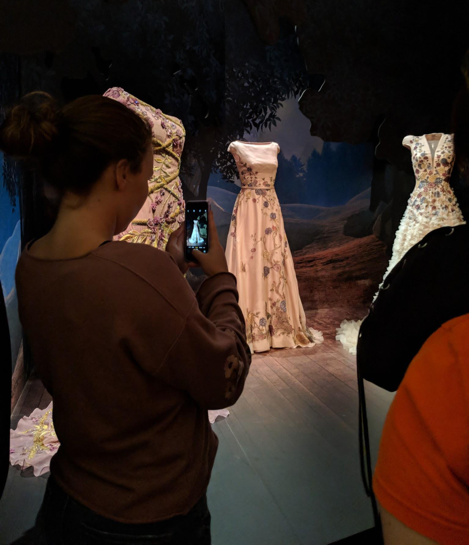 The Centraal Museum was particularly crowded because of a special exhibit showcasing some of the collection of Dutch clothing designer Jan Taminiau. 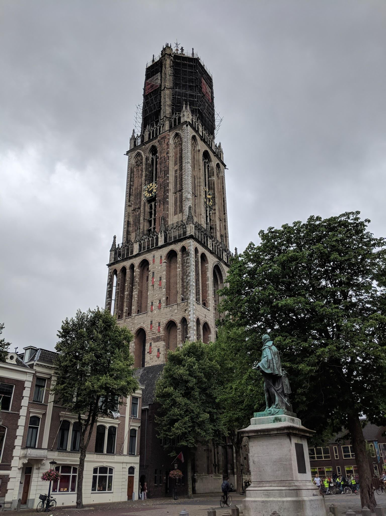 Utrecht’s pride is their Domtoren, a 14th century bell tower that is the tallest in the Netherlands. Opposite the Domtoren is the Cathedral of St. Martin. Both of these iconic structures lie within the Domplein Square, which is also the biggest Medieval city square in the Netherlands. Another unique feature of Utrecht is their canal system. 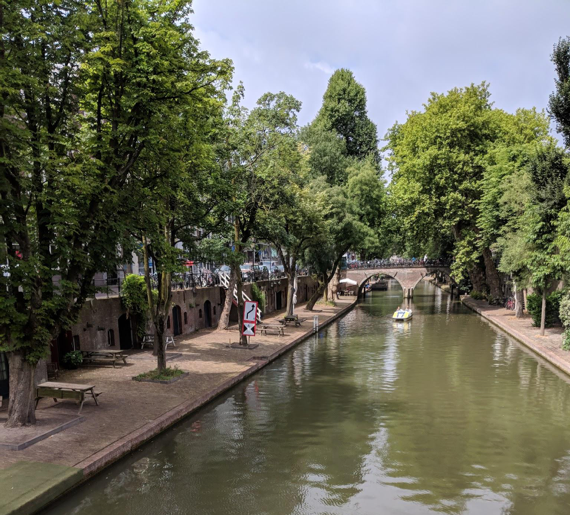 They have comparably fewer canals than most other cities in the Netherlands (just three), but wealthy families who owned the canal houses many years ago built basement tunnels next to the canals to more easily move goods from canal boats into their homes. Today, many of those basement tunnels have been transformed into cafes and restaurants that allow you to relax canalside. Only a few days are left of the course: I can’t believe how fast it’s gone, and how much we’ve managed to squeeze into these last ten days! I can’t believe how fast these past two weeks have gone! 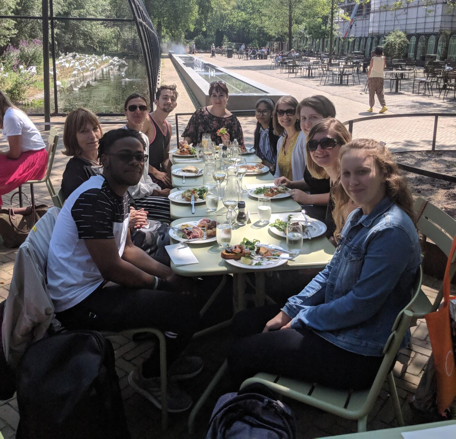 We had our last group lunch right next to the zoo, and our last group dinner on Saturday at Cafe Restaurant Dauphine, a converted garage. I’m writing this, my final blog post, on a train headed from Brussels to Frankfurt. My travels in Europe continue for one last week, but the course (along with my time in Amsterdam) is now complete. 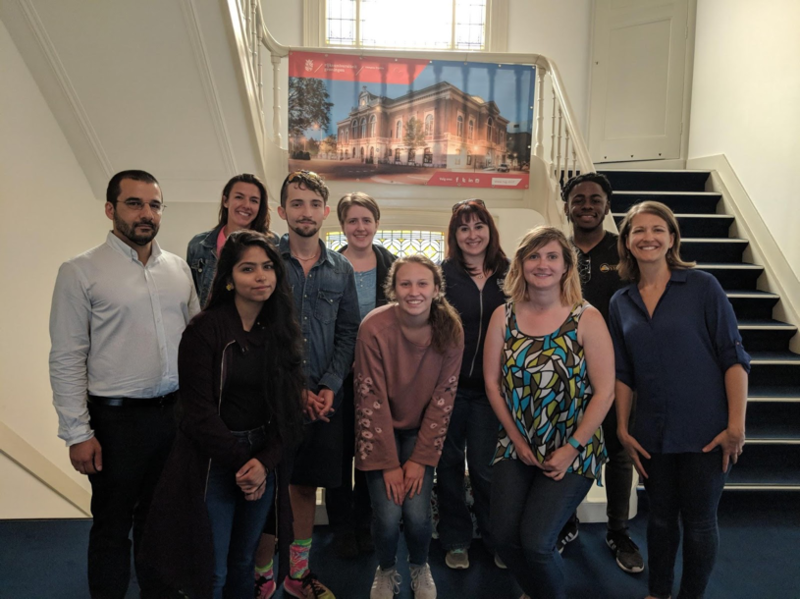 A highlight of our final days was a discussion with Dr. Annette de Groot, Emerita Professor of Experimental Psycholinguistics at Universiteit van Amsterdam. She talked with us about her research on the cognitive impacts of multilingualism, specifically the expanded perspectives and conceptual knowledge one gains. We also had a fascinating discussion about the decision an increasing number of international universities are making, including several in the Netherlands, to designate English as a lingua franca as the primary language of instruction. Dr. de Groot has a wealth of knowledge and a balanced, realistic perspective that aligned well with what we’ve been learning thus far in the course. She also helped us think more critically about the wider impacts of the expansion of English around the globe. 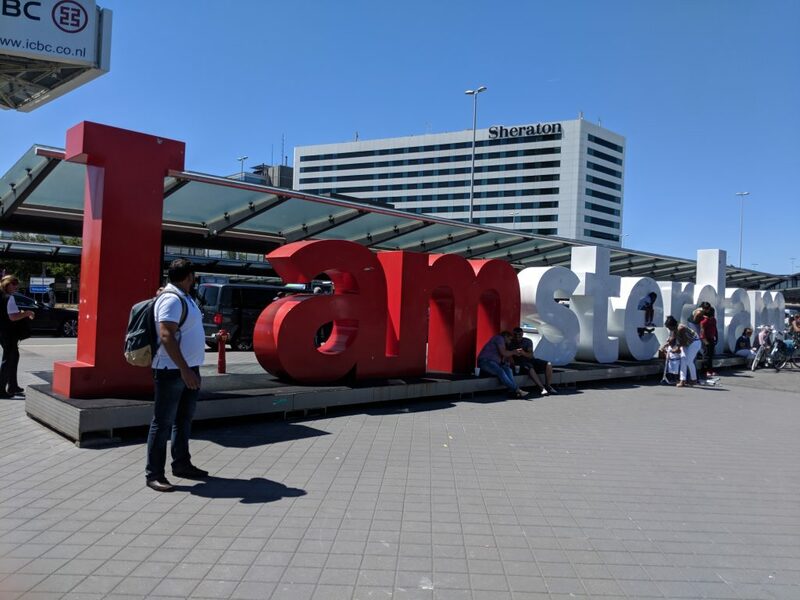 Looking back at my now complete Amsterdam adventure, what comes to mind were those words we used to describe our first impressions of the city, words like “energy,” “chill,” “cultured,” “bold,” and “dope.” Amsterdam lived up to it all. The city was welcoming and easy to navigate, and we got to experience a multilingual city in action. For us, that meant readily accepting the advantage of our English knowledge, but also witnessing the friction and destabilization that encroaching English can create for other native languages. Those of us in the course came from a wide collection of disciplines: myself, a PhD, and my classmates from linguistics, communications and mathematics, global studies, public health, ESOL, information technology. Regardless, I think we all found something uniquely valuable in this trip. Each of us grew, at least a little bit. We found new directions, new goals, new friends, perhaps even a new appreciation for comfy footwear. What I will take back with me is an even greater sense of respect for multilingualism, coupled with a healthy side of humility regarding my own monolingualism. It was a fantastic experience, and Amsterdam such a lovely host. Until next time!